"We are ready to be first to start building on Mars." With the rising cost of rent, things may look bleak for people who are looking to own a home someday. However, Apis Cor, a San Francisco start-up company, now has an easy and cheap solution. And they’ve proven that it works. The largest issue with construction is both expensive and time-consuming. Building even a decent sized house can cost a family well beyond their means and takes many, MANY months to complete. Apis Cor counters that by specializing in mobile construction 3D printing which is capable of printing whole buildings, completely on site. They have dedicated their work to change the construction industry so that millions of people who are in need will have the opportunity to improve their condition of living. The key to saving clients more money is the fact that the 3D printer and all its supplies are designed to be effortlessly transported, don’t require a lot of preparation to install, and can be dismantled with ease. The printer itself is a tower crane that is set in the middle of the construction area. It uses a concrete mixture that is fed through the printer to print out that foundation of the house. Once the building is complete, the printer is lifted out from within using a crane manipulator. The printer only requires 2 operators to control the software and to refill the foundation supplies, and it consumes eight kilowatts of power. There are zero kilograms of construction waste, which not only makes this house cheap, but green. Also, Apis Cor only charges their clients by the square meter. The printer not only can be programmed to print out a framework for a foundation, but it also cuts down on the outer and inner finishings. Since it has machine precision, it can make all the walls even and smooth. 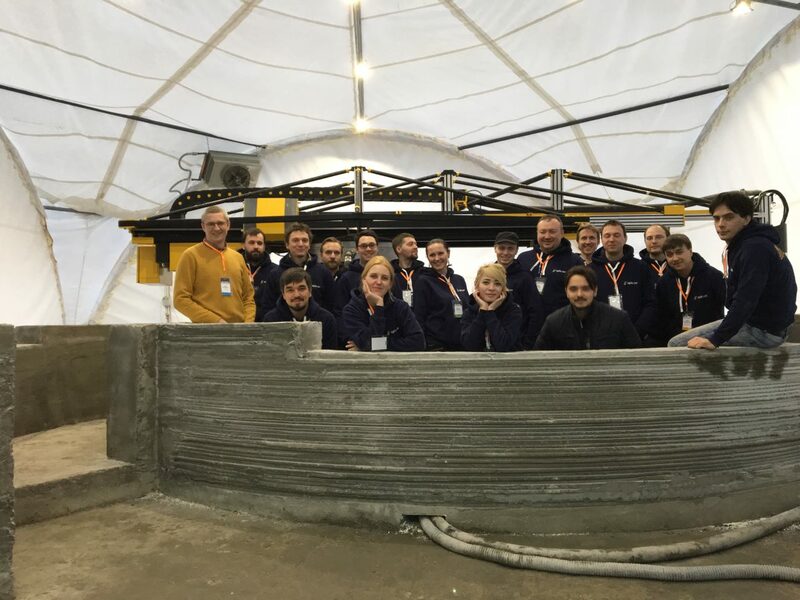 Apis Cor made their first house this year in Russia during their coldest season to prove their process works anytime during the year. Since the temperature was -35 degrees Celsius, (-31 Fahrenheit) and the temperature that concrete sets at correctly is above 5 degrees Celsius (41 Fahrenheit), the simple solution was to set up a sealed tent around the construction site which kept it warm enough to print. Mind you, the houses that Apis Cor builds currently aren’t that big. Their first house in Russia is only 409 square feet, which is roughly the size of a small one bedroom apartment. Also, the 3D printer doesn’t print a roof, and you’d still need to have doors, windows, electrical, plumbing, and insulation installed. Still the whole thing costs about $10,134 to be built and it only takes a single day so for some the trade-off is worth it. LOL, with my experience with legos, this was much easier that is for sure. There is something very calming for me when I watch any sort of 3D printing. This is a huge scale of course, but does the same for me. I hope it works for the industry. Very simple. Low cost and the turn around time is pretty great for something like this. I cannot wait to see the end result with decor and things like that. Tiny houses are all the rage, so why wouldn’t this just fit right in with that?